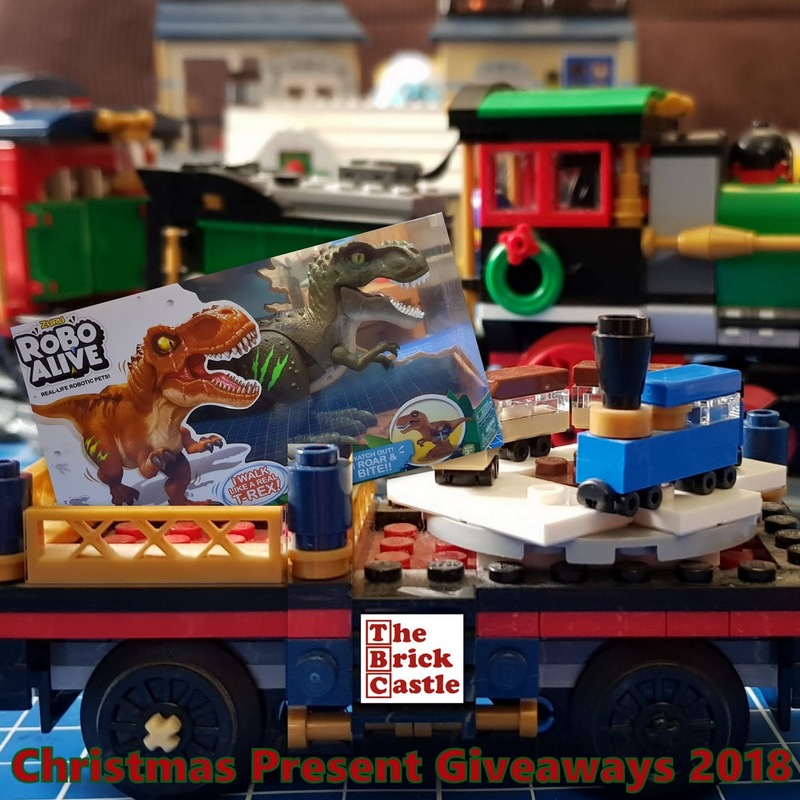 This is a toy giveaway which is aimed more at younger members of the family. Sent to us for review by Zuru Toys, the Robo Alive Dino is a walking, roaring Dinosaur who opens and closes his mouth and will no doubt be very popular with young paleontologists. The Dino takes ages to unpack and open. 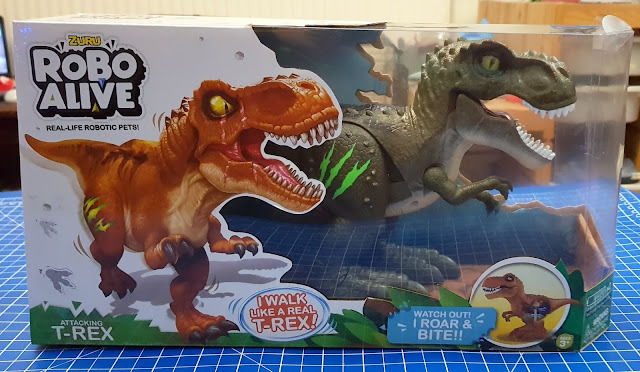 It's not difficult, there's just a lot of tape and then the Dino's feet are fastened on by plastic pegs. You'll need 2 x AAA batteries too, so I can't call this one entirely Christmas-morning friendly. Once the batteries are in though, he's away. 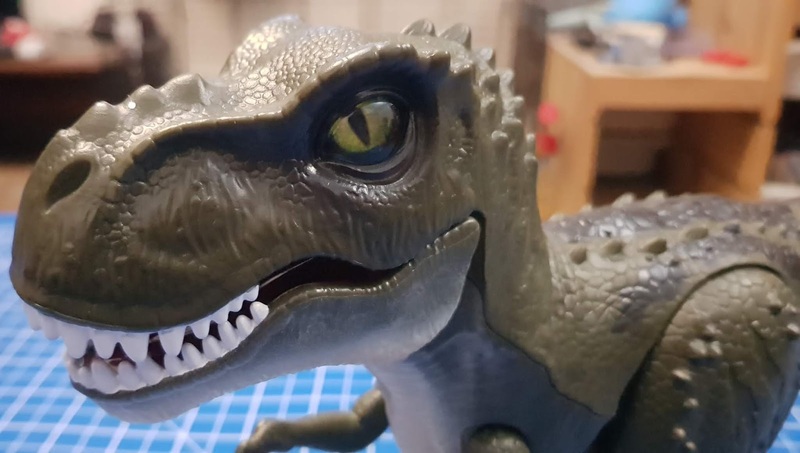 The Dino has an on/off switch and once 'on' he doesn't stop. He walks, growls and roars, and chomps his teeth and looks pretty ferocious. In a fairly cute way. 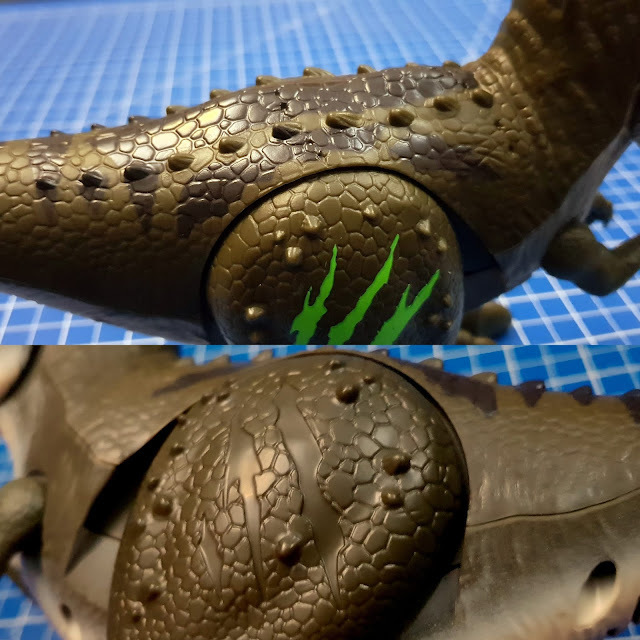 On the side of the Dino is a brightly coloured scar which stands out in dim light. He's got a great finish with dinosaur bumps and lumps and realistic lizard skin. My 10 year old had a dinosaur similar to this when he was younger and he loved it. I admit the noise was a bit much at times, but mainly he'd just have it stomping back and forth up the hall keeping guard for enemies. He'd have been much more impressed with the Robo Alive Dino because it is far more 'realistic' and makes several different sounds and actually looks like he's roaring at you! My 10 year old's recreation of "The boy on the back of the box". 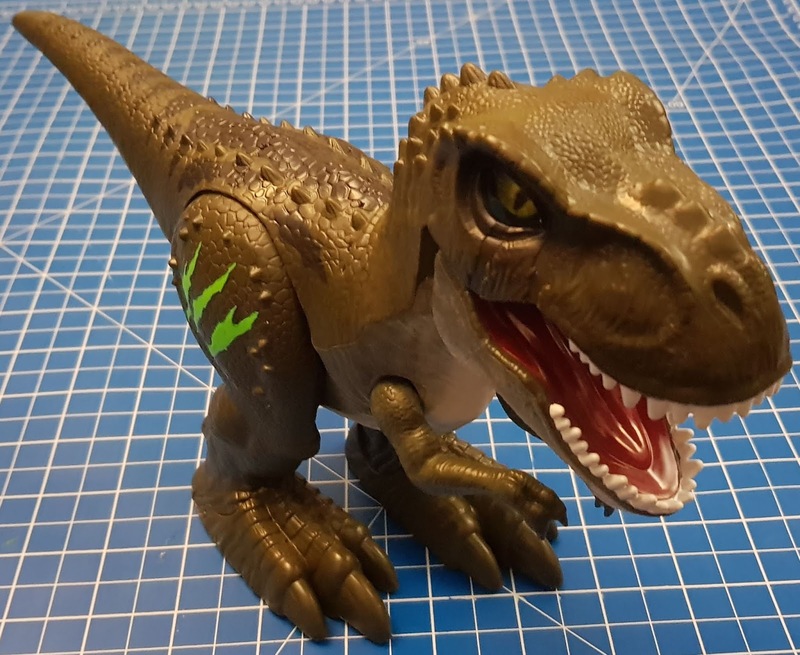 We've been sent the 'Attacking T-Rex' in green, he's also available in orange, and if dinosaurs aren't your thing then there are several different creatures available including Snakes and Lizards! 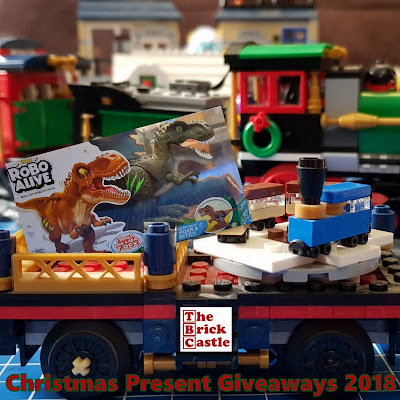 Robo Alive Dino is available to buy now priced £16.99rrp from all good toy and game shops, including online at Amazon*. 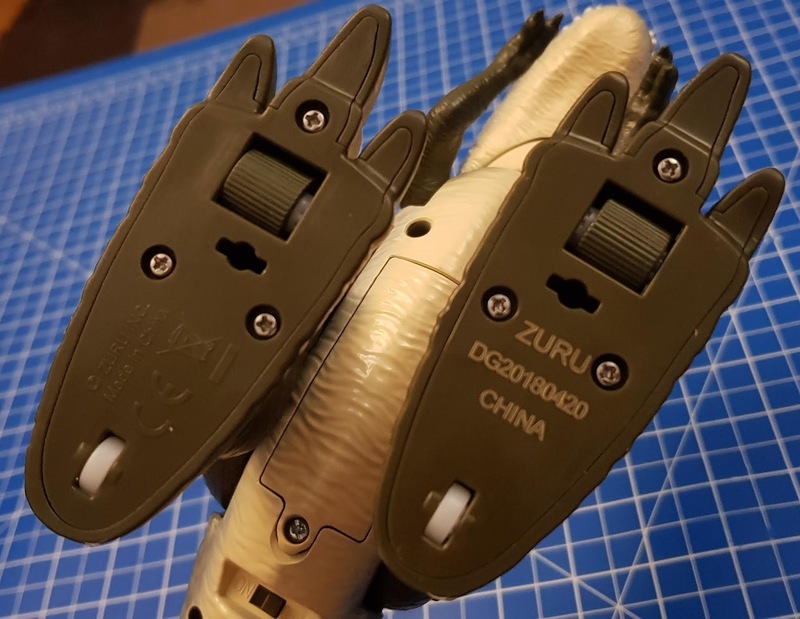 For more information about the entire range available see the Zuru Toys website. Zuru Toys have also offered a Robo Alive Dino as a Christmas Present for one of my readers. You don't get a choice of colour, that'll be a surprise! Entry to the giveaway is by Gleam form below. No entries are mandatory, but each extra task performed earns and extra entry into the random draw. Your personal information will ONLY be used to administrate this giveaway - I won't need it unless you win! 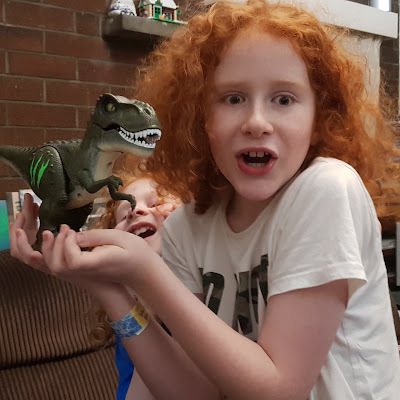 We were sent our Robo Alive Dino for review. *Amazon links are affiliate, which means I earn a few pence as a thank you for my time if you order through my link, but you don't pay any extra. It helps keep the cat fed and the website viable! I had a Major Morgan and a Tomy Chatbot that apparently drove my parents nuts lol! i don't remember any powered toys but had a lot of fun with my whoopee cushion! Xylophone ( played badly) and tingling trudy doll that repeated the same thing ! A Transformers toy which made a lot of noise. I played the trombone - does that count?!! I loved my Christmas Furby! I had a xylophone that i liked to whack loudly. I played the piano, by far my favourite noise, when I was upset after school I would go and thump tunes out on the piano for a while to calm down! Mousetrap (lots of screaming from me and my brothers). Mine were not noisy, I played outside mostly. I had a keyboard that I love to play (bash about) loudly! I actually had a little robot my dad gave me that made funny noises and went around on the floor. I think I still have it somewhere. I think my mum and dad had it sussed because I cannot remember having any noisy toys! My favourite noise toy when I was a kid was Operation!!! When you hit the sides and that buzzer went off, oh my, as a kid, it frightened me! We had a very old lego train which ran on some weird battery packs & we built a track between mine & my brothers room & used to send messages to each other when we were supposed to be asleep. I adored my Speak and Spell but apparently it was loud and had an annoying voice. I had a plastic red record player - does that count? A steam train that used to puff out steam. It was noisy and the steam smelled awful! SIMON - I would play that for hours challenging my brother. I loved my toy trumpet. mine was Dream phone, i can still hear 'he looks good in whatever he wears', loved that game. Mine was my little keyboard! I learned to play the recorder and I thought it sounded great but nobody else liked it! An electronic keyboard - i used to play for hours with that! The only noisy game or toy I can remember from my childhood was "Operation"
My Guitar. I was a bit rubbish. i loved jem dolls when i was young! I had a drum when I was very small but thinking back I don't think my parents really allowed us any noisy toys. They're happy to buy my son them though! I used to love this thing which used to jiggle around across the floor. No idea what it was called. I didn't have any noisy toys - honest! A Doll which constantly said mama mama, when the dummy was removed. I had musical carousel that my grandparents gave me. I loved it and thought it was magical, but my parents hated it. My furby! Although it used to annoy my sister so much she once hid it under all my clothes at the back of the wardrobe trying to shut it up LOL! My recorder was a very noisy toy. My teddy ruxspin cassette player toy, it used to move its mouth like it was reading the story.